It is our goal to educate people about the true nature of these animals. We work continuously to keep bears safe, alive and happy (yes, bears express emotions like happiness and unfortunately, fear and sadness as well). Please help us positively affect the lives of as many of our dear furry friends as we possibly can. Together, we can share compassion with all of Mother Earth's Children. If their experience tells them they can expect to find food where humans live, with no resistance from those humans, then look for food they will. If instead they realize that people will defend their ‘food caches and dens’ and not allow the bears to feel Welcome, they will not bother us. When a person is fearful and runs from a bear (something one should never do) by retreating inside he is telling the animal “You are welcome here…I am not going to defend my territory”. 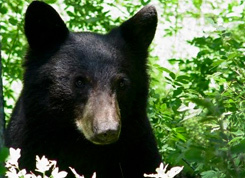 Too many bears now believe they can roam neighborhoods and even come into houses as this is what they have been told by humans reacting inappropriately during bear encounters, which often results in the death of a bear. Help us change that.